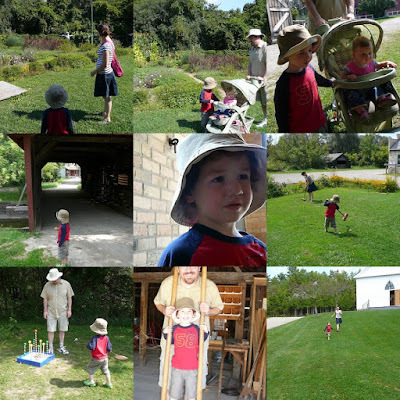 Today we went to Doon Heritage Crossroads outside of Kitchener. Inside of each house (we may just put an offer in on the one in the lower right hand corner in the pictures of the last blog post, I fell in love with it and its garden:) William would say 'let's keep moving', until we got to the blacksmith's and watched how they made horseshoes. We know that it was only the fire that kept William in his trance (see middle picture) but we'd like to think he was taking it all in and learning some history. Rosie just loved the pigs. It was a perfect summer's day here and we ate yummy veggie cheese bread we bought at the St Jacob's bakery, with cheese for lunch. William loved the mini tractor pencil sharpener we bought in the gift shop. I love Doon! I've had a bunch of friends work there over the years, so I've gotten behind the scene access. Like free homemade ice cream in the attic of one of the houses :D I'm glad you had a good weekend so far!